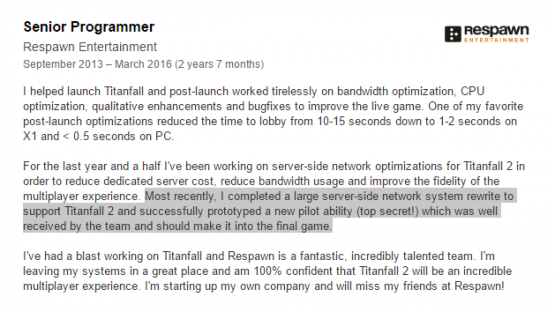 Titanfall 2 Gameplay to Include "Top Secret" Pilot Ability & New "Network Optimizations"
A keen staffer over at VideoGamer has spotted a few curious Titanfall 2 details on a former developer’s LinkedIn profile page. What could be added to the existing wall running and jetpacking abilities, I wonder! Perhaps we’ll hear more about this “top secret” ability during the big gameplay reveal at EA’s E3 event “EA Play.” We’ll have to wait until June 12 to find out! Read up on why we’re excited for Titanfall 2, or get up to speed on the original game’s story in this 60-second recap. What do you make of this new ability? What would you like to see added in the Titanfall 2 PS4 release?